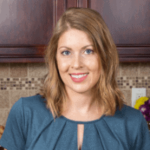 Published: May 31, 2016 · Modified: Apr 12, 2019 · By Jen Sobjack · This post may contain affiliate links. 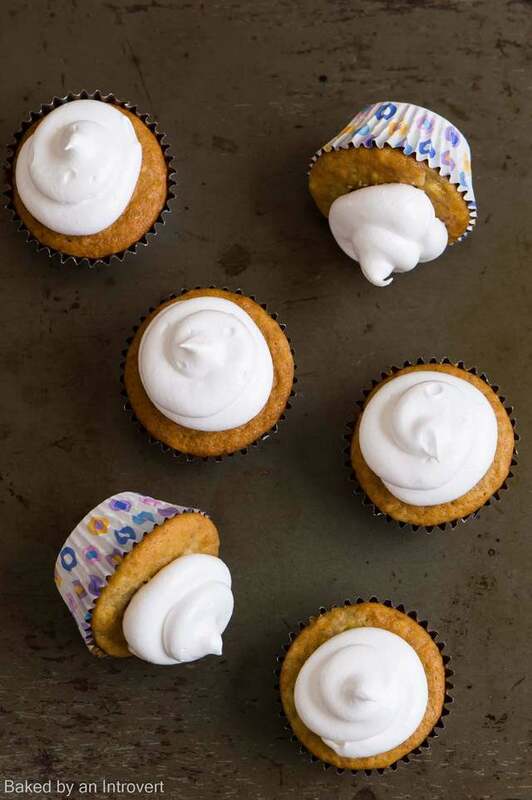 In an ode to banana pudding, a southern classic, these Banana Pudding Cupcakes feature a banana flavored cupcake with a vanilla wafer on the bottom, filled with homemade vanilla pudding, and topped with marshmallowy 7-minute frosting. These cupcakes taste just like an old-fashioned banana pudding dessert made from scratch. If you are looking to bake something new and exciting, this cupcake recipe is the one for you! Let me preface today’s recipe by saying my absolute most favorite dessert in the entire world is a classic Banana Pudding! Not that fake banana flavored pudding in a box with sliced up bananas and cool whip smeared over the top. I’m talking about the real deal. The stuff grandma used to make. The double boiler homemade vanilla pudding, the warm chunks of banana and soggy vanilla wafers, the sky-high meringue, the labor of love! This, you guys, would win my heart forever. Just an FYI. In case, you needed to know. Today’s Banana Pudding Cupcakes recipe was inspired by this ever so dreamy classic southern dessert. 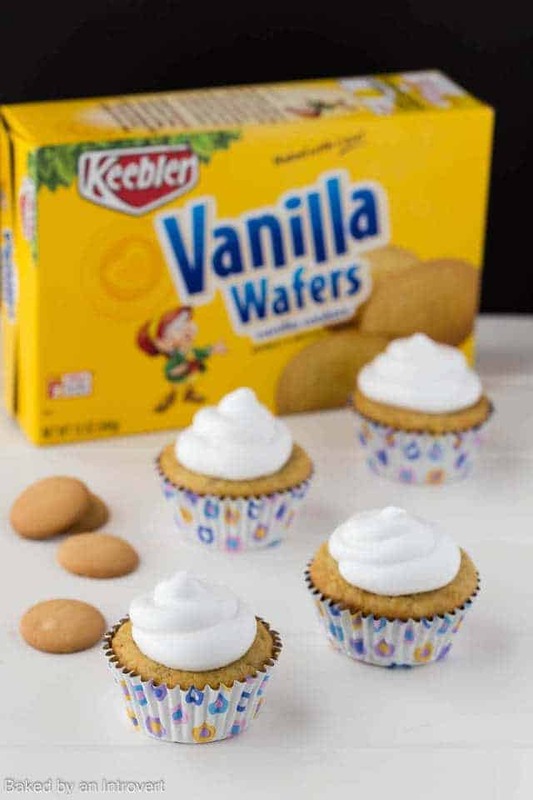 I found Keebler Vanilla Wafers at Kroger and decided to put one into the bottom of each cupcake. You can’t have banana pudding without the vanilla wafers! I grew up eating Keebler cookies. My mom kept them stocked in our pantry and I was allowed to have two or three as an after-school snack. So, it’s only fitting that I use a classic cookie in a recipe that mocks a classic southern dessert. Inside the cupcake is a hidden gem of homemade vanilla pudding. I made it simple for you, though. You don’t need a double boiler for this one. It’s all done in a pot over a medium heat. If you accidentally scramble the eggs, don’t stress. Run the pudding through a fine-mesh sieve once it has finished cooking to remove any chunks. Let’s talk about the frosting. Traditional banana pudding is topped with a delicate meringue that browns nicely under the heat of the oven. Since you can’t exactly put a filled cupcake back into the oven to cook meringue on top, marshmallow frosting seemed like a suitable alternative. And boy was it ever! I like to pipe the frosting onto the cupcakes, but you can certainly spread it on if you wish. Either way, these cupcakes will still taste fabulous! These cupcakes are certain to take you back and give you a sense of nostalgia. Especially if you grew up eating Keebler cookies and banana pudding. Banana Pudding cupcakes turned out to be the best way to combine two classics and turn them into something fun and new! Make the filling: In a small saucepan combine the sugar, cornstarch, salt, and milk. Stir with a whisk until well combined. Bring the mixture to a light simmer over medium heat. Gradually add the half of the warm milk mixture to the egg yolks while whisking continuously. Return the mixture to the pot. Cook the mixture over medium-low heat, stirring continuously until it thickens. The mixture should coat the back of a wooden spoon. Remove from heat. Stir in the butter and vanilla. Transfer the pudding to a small bowl, cover, and refrigerate for at least 2 hours. Make the cupcakes: Preheat oven to 350ºF. In a large bowl, combine the butter, banana, and granulated sugar; beat on medium speed until smooth. Add the eggs one at a time; beat well after each addition. Beat in the vanilla extract. In a separate bowl, combine the flour, baking powder, baking soda, and salt in a medium bowl; stir with a fork or whisk. Gradually add the flour mixture to the banana mixture alternating with the milk. Begin and end with the flour mixture. Line 15 muffin tins with paper cups. Place 1 vanilla wafer into the bottom of each cup. Spoon 1/4 cup of batter over each wafer. Bake for 20 to 24 minutes or until the cupcake springs back when touched. Remove from pan immediately and allow the cupcakes to cool completely on a wire rack. Cut the centers out of the of each cupcake. Fill the cupcakes with the pudding. Make the frosting: Combine all ingredients in a large glass bowl. Beat on low speed for 2 minutes. Bring 1 cup of water to a boil over medium heat. Place the bowl over the pot. Beat mixture on high until the stiff peaks form and the mixture reaches 145ºF. Remove the bowl from the pot and beat the mixture for 5 minutes more or until it reaches a spreading consistency. Spread or pipe the frosting over each cupcake. 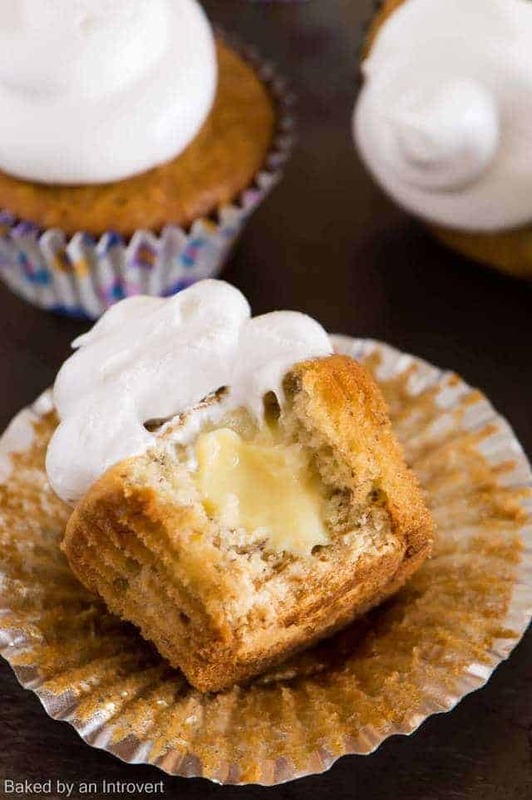 These banana pudding cupcakes look so amazing and yummy at the same time. Found your post so easy to follow along when preparing them yesterday. So mesmerized by this. Thanks for sharing! Thanks, Julia! I’m glad you liked the cupcakes. This is a great banana pudding cupcakes recipe, as you know I made it a short while ago and it was lovely, in fact have made it again since. Thanks for sharing! Do you suggest storing these in the refrigerator? I’m planning on baking them on a Saturday and surprising my boyfriend with them on his birthday (the Monday). I’ll also be traveling with them for about a 3 hour car ride. I can keep them in a sealed cupcake caddy in an ice chest if needed. The hotel has a mini fridge. Are they better room temp or chilled? Yes, store them in the refrigerator so the pudding center doesn’t spoil. They taste best at room temp though, so let them sit out for about 30 mins before serving. Enjoy! Just baked these this morning…WOW! This recipe was a cinche to follow! And they are amazing!! Can’t wait to take them to my party! I hope everyone at the party enjoys them! What great inspiration for a cupcake! So fun and delicious! 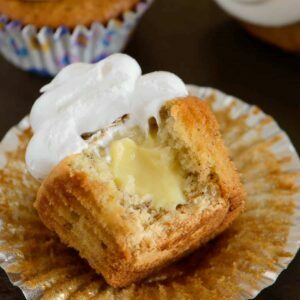 I LOVE banana pudding and banana cream pie so I’m crazy about these cupcakes! 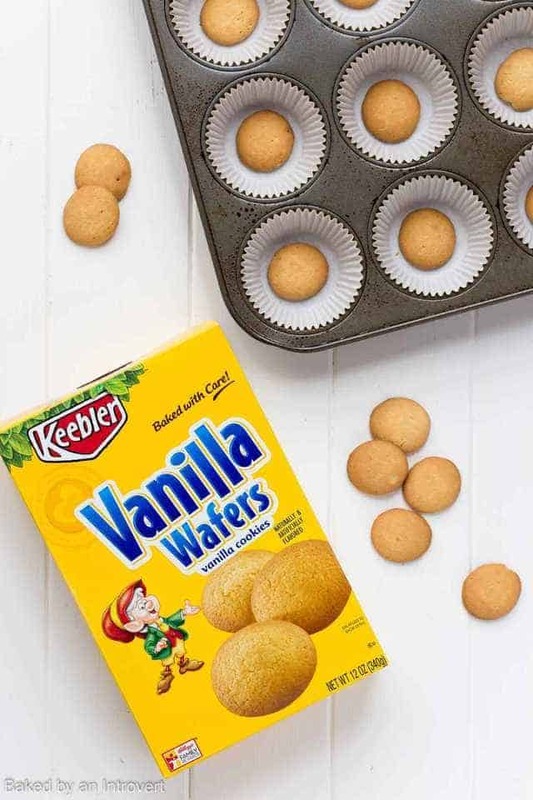 The Nilla wafers on the bottom is such a nice touch — I definitely need to try these! Oh my goodness! I love these cupcakes. They are so cute and look amazing. I can’t wait to make these! GET OUT! Jen, these look sensational!!! One of our favourite foodie memories of the USA was trying Magnolia’s famous banana pudding. We don’t have anything like that here. Now I’m totally craving these gorgeous cupcakes! Pinned. I absolutely love banana pudding! This is such a creative cupcake idea! Totally brilliant! I could seriously swim in a vat of banana pudding… you know if I could shrink myself and all. So I am seriously swooning over these cupcakes!! Absolutely GENIUS, girlfriend! I am totally making these over the weekend and binge eating them all! Pinned! Cheers! Boy do these look good! I was seriously devoted to banana pudding when I was a kid, so these really take me back! Delicious! Ohhhh my gosh, Jen! You are giving me the HUGEST banana cream pie craving ever! I’m a total sucker for real-deal banana cream pie and these cupcakes definitely look like they fit the bill! They are stunning!! Oh my…. Nothing says southern classic like banana pudding! And these cupcakes are perfection! Love the surprise center!! These cupcakes look gorgeous! Thanks for the reminder, I’ll definitely try the recipe very soon! Pinning! Banana pudding is a classic southern dessert consisting of layers of vanilla wafers, sliced bananas, vanilla pudding, and meringue. The cupcakes mimic that dessert with a vanilla wafer bottom, banana flavored cupcake, vanilla pudding in the center, and topped with marshmallow frosting. Hence, why I called them banana pudding cupcakes. Scoop the center by using a small knife to cut a circle in the top of the cupcake, holding the knife at an angle as you go. The center should pop right out leaving you a small well to fill with pudding. I’ve never done a filled cupcake before, but you’ve just inspired me to get in the kitchen! So pretty! I assume store in the refrigerator? You’re in for a real treat with these, Jacqueline. Yes, keep them stored in the refrigerator so the filling doesn’t sour. Let them sit out for about 15 minutes or so before serving so they become soft again. Enjoy! These sound delicious!! I love the banana pudding center and I’m obsessed with marshmallow frosting. It’s just heavenly! Thank, Sarah! These are the best cupcakes I’ve ever made. You must try them! Really enjoyed this recipe. Noticed that the baking powder isn’t listed on the ingredients but is in the instructions. I improvised and they turned out great! Thanks for the recipe! How much milk do you need for the filling? The instructions say you add milk, but there’is no amount for it in the filling ingredients. It should be 1 cup, Bess. I don’t know how I missed putting it in the recipe card. Thanks for bringing that to my attention. Wow! I’m amazed that every component of this recipe is homemade! Way to go! I love this!!! Especially the surprise center 😀 It’s a good thing I have a whole bunch of bananas leftover…must try these ASAP! Yes! You must. I know for certain you will go nuts over them. Enjoy! Banana pudding is my ultimate weakness! These cupcakes are literally making me drool just looking at your gorgeous photos! I love how perfectly filled they are and your piping is gorgeous! I love that marshmallow frosting! These cupcakes sound so good, especially with that hidden filling inside! YUM! What do I say that I haven’t said before..you make such pretty desserts Jen..the cupcakes look spectacular..so soft and perfect! Pinned! You are always so incredibly sweet with your comments, Manali. Thank you! I’ve been working on my banana pudding recipe for a few days and this is a nice twist on the typical pudding. Banana pudding is one of my all-time favorite comfort foods, so I’d be alllll over these! When I saw this on your instagram feed I knew I had to have the recipe. I love banana cream pie and banana pudding everything and these sound divine. Pinning of course! Thanks for pinning, Aimee! Enjoy! Mmm – I bet the banana pudding in the center makes these so moist! I’m sad to say I’ve never had homemade banana pudding, but the way you describe it makes me feel like I’ve been missing out on something magical! Girl, you are definitely missing out on a wonderful treat! I love banana pudding, but haven’t had it in forever. These cupcakes look so delicious! These cupcakes are beautiful! Love that frosting!!! Pinning! These look delish! I don’t think I’ve ever put banana in a cupcake before. It’s a great idea! Oh, it’s the best. 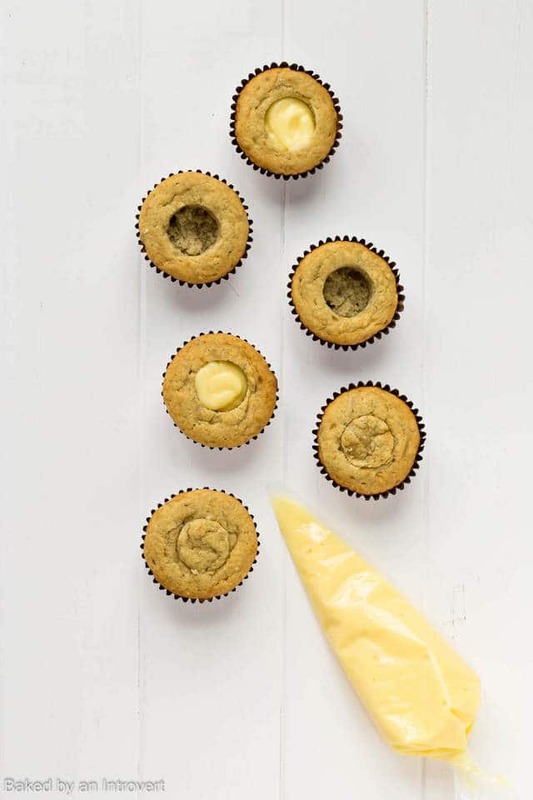 You’ll love banana cupcakes! These look beautiful and I love the hidden surprise inside! Send some my way, please! Sorry to hear about your lack of focus! Hope you feel better! Pinned these cuties!!! They’re on they’re way to you! Thanks for pinning! WOA – That pillowy marshmallowy frosting is gorgeous! And look at that filling! Mouthwatering! Oh my gosh, I love banana pudding and stuffing them into cupcakes is genius! These look beyond incredible and I seriously want five of them right now! Thank you, Kelly. They’re slowly getting better. Let’s eat five cupcakes! Who’s counting?! I love that filling shot – these are perfect!! You’re so kind, Dorothy! Thank you! Jen, ok, I LOVE banana pudding… and you put this into a cupcake?!!! oh my gawd, I LOVE these!!! I just pinned. . hope you get a ton of re-pins!!!! these are fabulous!!! Oh my goodness these cupcakes look absolutely amazing!! I love the vanilla pudding filling yum! Banana pudding is my favorite, too! It’s one of those desserts that I don’t eat a lot, but each time I do, I silently vow to make it more. I’m in love with these cupcakes, jen! These are seriously calling my name right now. And that frosting is the perfect touch! Yum! I don’t eat it nearly enough. I honestly can’t even remember the last time I had it. That’s so sad… Thanks for the lovely comment, Gayle!